Ford, Hyundai, Maruti Suzuki and Volkswagen offering heavy discounts and offers on select products. Vento and Xcent being sold with cash discount of Rs 50,000. Lucrative offers on the Ciaz, EcoSport, Grand i10 and Yaris too. With feeble growth recorded in the last financial year, carmakers are offering lucrative discounts and offers on their products. With Gudi Padwa and Navratri considered as an auspicious time to buy a new vehicle, manufacturers would be hoping to draw in the numbers. Volkswagen hasn’t given the Vento an update in a while and it has really started to show its age in comparison to rivals. Well aware of this, the German car maker is offering a Rs 50,000 cash discount on the C-segment in addition to a Rs 40,000 exchange bonus and a corporate discount of Rs 25,000. Those interested in the Ameo get Rs 30,000 off from the sticker price along with a Rs 30,000 exchange/corporate bonus. The story is similar for the Grand i10. With the refreshed one expected to make its way to the market soon, Hyundai too is giving a Rs 50,000 cash discount over and above a Rs 20,000 exchange bonus and a 3-gram gold coin. Although the Korean car maker is also offering a Rs 20,000 exchange bonus and the 3-gram gold coin on the Santro, better offers on the Grand i10 really narrows the gap between the two models. SUV buyers can also avail benefits of up to Rs 1 lakh on the Tucson. Maruti Suzuki also has some interesting offers on their cars. The DZire is being sold with a discount of Rs 40,000 – Rs 20,000 in cash and the rest in exchange. The Vitara Brezza has similar schemes with a cash discount of Rs 15,000 and exchange of another Rs 15,000. If it’s a compact SUV that you are looking for, you may want to walk into a Ford dealership as well. The American carmaker has a cash discount of up to Rs 35,000 and an additional exchange bonus of Rs 15,000. The carmaker is offering similar offers on the Freestyle too. Select Toyota dealerships still have stock of the MY18 Yaris. The V and VX trims of the Yaris are being sold at a discount of Rs 84,000 if customers avail finance from Toyota. Additionally, dealerships are also offering Rs 50,000 as Exchange and Corporate. Honda is one of the few manufacturers not offering any major discounts on their products. 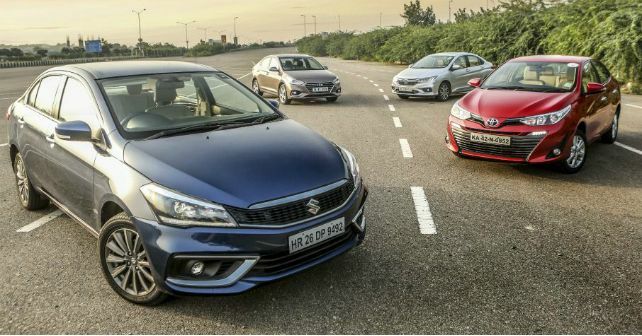 They do, however, offer the first year’s insurance without an additional charge and Rs 15,000-Rs 40,000 exchange bonus depending on the car you select.